Want to work from home, but don’t know what to do? Do you find that you spend hours researching work at home opportunities, only to come up with scams? Yup, that was me for many years. Each time I was in between jobs or spending the day at home with a sick child, the desire to work from home would only grow stronger. So fast forward to today; I currently work as a virtual assistant for several clients and I truly love what I do. 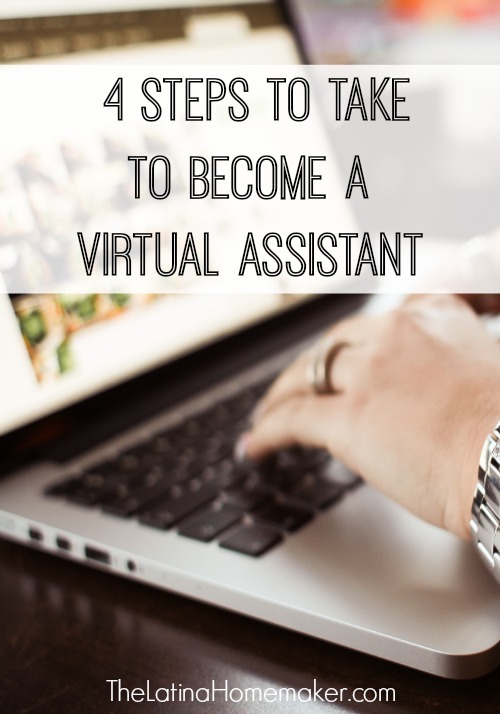 So what is a virtual assistant (VA)? A virtual assistant is a professional that provides administrative support virtually. I create content for some websites and manage schedules for others. Each day my work varies, but in the end, I’m able to contribute to our household expenses and still be at home with my kids. So today I’ll be sharing some tips to help you get started. What are you good at? Notice I said good, not the best. I say this because if you know how to do a task, you don’t need to be an expert to do it. I’m not a chef, but I can still whip up a delicious meal for my family. The important thing is that you have skills that your clients need and are willing to pay for, don’t doubt yourself. What do you enjoy? For many years I worked part-time as a translator/interpreter from home along with a full-time job. Funny, that at the time I didn’t realize that what I was doing was, in fact, VA work. However, I never truly enjoyed it although I was great at it. So make sure that you not only figure out what you’re good at, but also what you enjoy. If accounting is not your thing, don’t promote it as a service because the moment you land an accounting gig you’ll be sorry you did. If you want to take this seriously you need to treat it like the business that it is. If you don’t know where to start the SBA website offers some great resources. In your business plan you want to answer questions like: What is my target market? What services will I offer? What are my business policies? Will I subcontract work if I get too busy? You need to know these things BEFORE you launch your business. It may not sound like an exciting thing to do, but trust me you don’t want to skip this step. You’ll find that as your business grows, having a plan will give you a clear vision on what to do and when to do it. Now the first thing that new virtual assistants want to do is create a website, but not all can afford to pay for one or have the knowledge to create one on their own. Please don’t get stuck at this stage. Simply create a free LinkedIn account and work it like it’s no one’s business. I have several colleagues that have found legitimate jobs simply through connecting on LinkedIn. Make sure you have a computer/laptop, internet and a quiet place to work. Depending on your target market, that’s all you should need to get started. I rarely print, fax, or even use my phone (thanks to Google Voice). As you slowly build up your clientele, you can invest in software and anything else you feel your business needs. You also want to check out your state and local laws to ensure you’re following their rules. I always hear new VAs complain about not finding work, but my question is, what are they doing to bring in more work? If your goal is to work 25 hours per week as a VA and you’re not doing it, you need to be spending those hours on marketing. Market to local businesses in your area, network online through social media sites and forums. I have personally used my social media sites to connect with current clients. Facebook has great VA groups where other virtual assistants will post job opportunities they know about. Figure out where your clients are spending their time and join them. Answer questions on forums, make connections and don’t be shy to pitch to them when the opportunity arises. There is plenty of work out there, you just have to go out and find it. 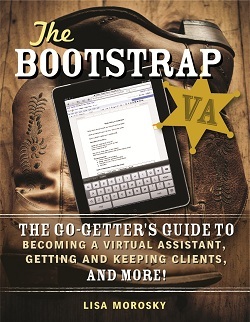 One resource that I personally recommended and it’s my go-to even now, is The Bootstrap VA book. It’s worth every penny and has been endorsed by many in the VA industry. Click here to check out The Bootstrap VA! Obviously, there are many things that I didn’t cover, but I hope this gave you a general idea of what you can do to get started in the VA field. Hi! I’m the fellow October mom you posted this link for. This was super helpful! Do you mind me asking how long it took to build up your business and what kind of pay it brings in? Both starting out and when you establish your business. I really appreciate your help! Glad you found this helpful. I started VA work many years ago while I worked full-time so my income was sporadic $200-300 here and there. From my experience, as long as you put yourself out there, it can take just weeks to land a client. If you want to make a full-time income, you definitely can. It’s going to depend on what you want to charge, how many hours you want to work and marketing yourself to land enough clients. Determine how much you need to make per hour (include taxes, overhead etc.) and figure out your rate. I know some VAs that charge as low as $25hr and others that charge $70+ per hour. It depends on what skills you will offer. My advice; research, learn as much as you can and join VA groups/forums. VAs are some the nicest group of professionals out there and love to help each other. Thanks for stopping by! Hi Jesenia. Thank you for your post!… You gave me a new hope and vision. I really want to be a VA translator, but , I don’t know how… How I get clients that need translation? where will I find them?. Do you have an extra advice please. Hi Andrea! That’s great that you know what service you want to offer! My personal experience with translation was a little different. I found that there were opportunities locally and virtually. If you want to be 100% virtual start with some translation agencies to gain some working experience and references. There are various agencies out there such as LanguageLine.com that will add you to their team to provide either telephonic interpretation or written translation. Once you have the experience consider doing it for your own business so you can charge more and control your hours. Hi! This is very encouraging! I have a 3 months old and a 2 year old I’m a stay at home mom and my husband works! I feel the need to do something or make some kind of income but I don’t know how!! Any advice how I could do this? Hi Erika! There are various ways you can make money as a virtual assistant. It can be anything that you already know how to do from a previous job or school. What’s important is that you figure out what you enjoy doing and turn it into a business. Don’t get caught up in trying to be an expert. As long as you know how to do something, you have the skill to make money from it. If you have any specific questions feel free to send me a message! Thank you for the information! Will be looking into this further for myself. Stopping by from Thrifty Thursday link up. I have heard about Virtual Assistants about three or four months ago. I’ve had some gigs posted on Fiverr, and I’ve been writing for clients over there for quite some time. I have enjoyed what I do there, but it is really hard to up your prices on a website that says your starting price for anything you do is only $5.00. I’d really like to write for people and charge more, but I haven’t found the platform. Can you give some specific VA groups on Facebook so that I can find them? I do have a website for my writing services, so, I’m already doing what I can to promote that service on my social media accounts. Pretty much though, I’ve struck out finding clients outside of Fiverr. Any help you can give would be truly appreciated. Hi Keelie! You can definitely can (and should!) charge more than $5 for your services. And yes, there are various Facebook groups specifically for virtual assistants which is something you’re already doing through Fiverr. Feel free to message me directly so I can send you links for the ones that I have personally found and joined. Hello! Thanks for the article, it has inspired me to get started in Virtual Assisting. I have now joined LinkedIn and also joined a few groups on facebook. With that said I am having a hard time really understanding how to get started without purchasing some book or program. I would really like to have more information before purchasing anything as I am not sure if the will work out. Any websites, groups or sites you also recommend? This is very informative. Thanks for sharing. As a working mom, I am looking for something more to help pay bills. I will definitely look into this.